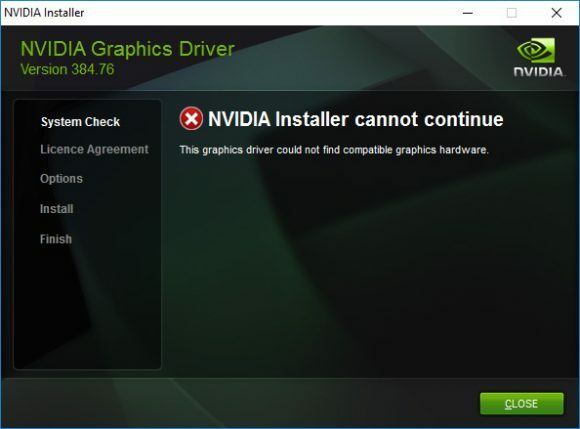 Since the GP106-100 GPU is intended only for mining and although based on the consumer GTX 1060 it is a different product the latest official Nvidia Graphics Driver 384.76 for GeForce GPUs does not have support for the Gigabyte NP106D5-6G. Things get even weirder when you go to Gigabyte’s website and you do not find a product page for that particular model, nor a support page with the drivers you need to install. There is no driver CD included in the package either, so you just go to Asus’ website and download the driver for their GP106-100 implementation and it works just fine. 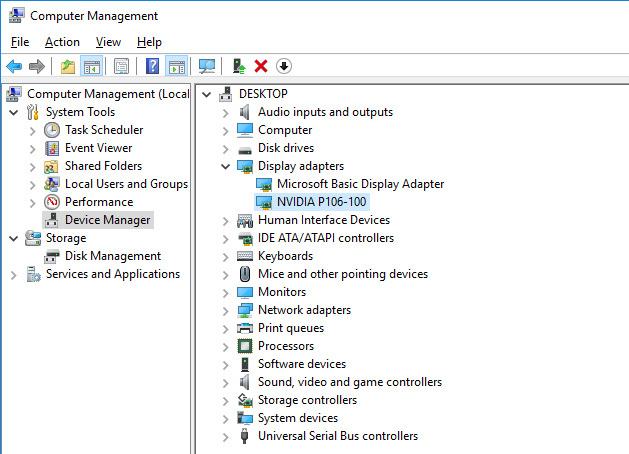 Since the Gigabyte NP106D5-6G GPU does not have any external video outputs you will need to use it along with motherboard that has a built-in Intel GPU support (or maybe even AMD APU). You still need to be able to install the OS and configure things some way, after that you can use remote administration of some kind to control and monitor things, so not that big of an issue. There are however some motherboards that can be used for mining with 6 GPUs, however you cannot get 6x GP106-100 GPUs on them along with the built-in graphics working, so you need to be careful about that as well. 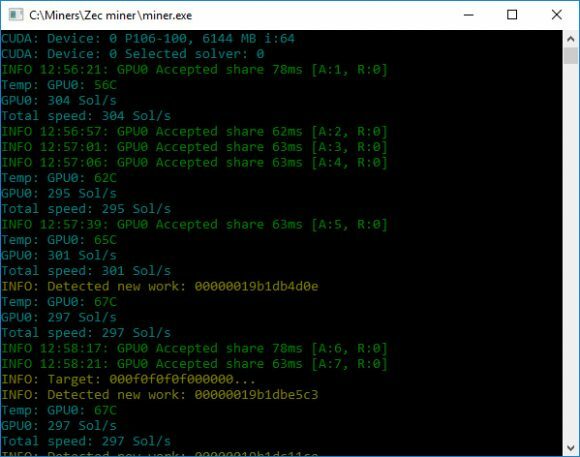 The mining performance for ZCash (ZEC) and other Equihash-based mining algorithms is pretty much the same as on a regular GeForce GTX 1060 6GB GPUs. You can expect to get around 300 Sol/s using the popular EWBF ZEC CUDA miner and overclocking the video memory does not help much in improving the hashrate, though playing with the frequencies can squeeze a bit more extra performance. Clearly while not bad in terms of performance these Nvidia mining GPUs are not intended to be sued for ZEC mining as much as for other crypto currencies. When talking about other crypto currencies we actually mean that the Gigabyte NP106D5-6G GPU and more specifically the whole Nvidia GP106-100 product is targeted at Ethereum (ETH) miners. 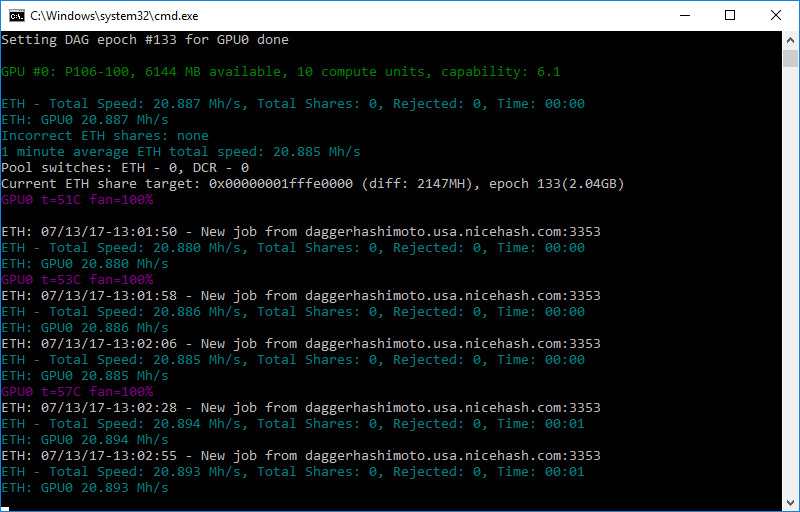 Using the latest Claymore ETH dual miner we managed to squeeze just about 20.9 MHS mining Ethereum with the card and unfortunately that is not very satisfying result. Still this is just the default result at stock settings, things get more interesting when you start tweaking things a bit. Overclocking the Samsung GDDR5 video memory has produced some surprisingly good results. We have managed to squeeze +900 MHz extra form the video memory using Afterburner and the card remained stable for mining. The result was a performance of about 26 MHS at stock TDP of 120W. Lowering down the TDP to 65% or with just about 80W per GPU the result was still about 25.9 MHS, so things started looking pretty good. So clearly Nvidia is targeting the product at Ethereum miners where with some overclocking it can provide really good performance results in terms of hashrate and power consumption. The big question here is if the slightly lower price of the Nvidia GP106-100 GPUs like this one on the retail market is worth for small home miners. Originally these were intended for large scale mining operations where the prices are probably more attractive when you are talking about hundreds and thousands units. 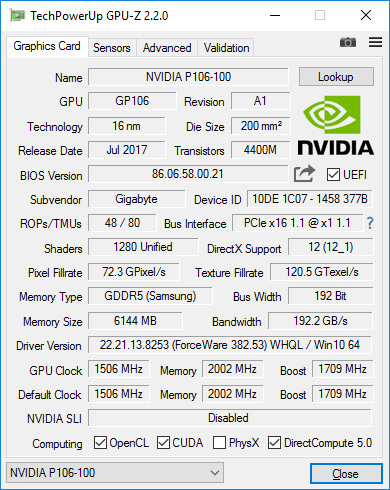 If you are able to get similar results in terms of performance from a regular GTX 1060 GPU with full warranty, video output connectors and no other cost cutting at a slightly higher price then things are may not be looking that good for Nvidia GP106-100. 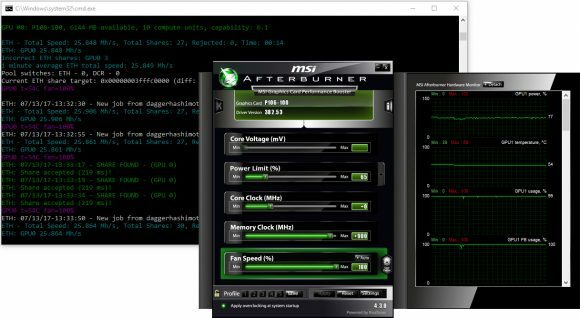 Though in our experience most GTX 1060 6GB models with 8 GHz video memory max out at about 24 MHS with overclocking on Ethereum. So it is up to you to decide if it is worth it, but again we are not too happy with Gigabyte’s solution to the mining problem. Their NP106D5-6G GPU is essentially a stripped down model of a consumer product to make it cheaper, not to make it better or more useful for crypto miners. Gigabyte NP106D5-6G is a variation of the Nvidia GP106-100 GPU targeted at miners and based off the consumer GeForce GTX 1060. Originally Nvidia had plans to sell these only to large miners, but apparently big partners such as Asus and now Gigabyte among others also want to sell these to small miners as well, so we actually managed to buy one Gigabyte NP106D5-6G from the retail channel at a price that is slightly lower than that of the regular Gigabyte N1060WF2OC-6GD that it is probably based on. The Gigabyte NP106D5-6G comes in an anti static plastic bag, no box or any accessories. It has a GPU core running at 1506 MHz Base Clock and 1708 MHz Boost Clock and comes equipped with 6 GB GDDR5 video memory running at 8008 MHz. Just like a regular GTX 1060 GPU, though there are some important differences to note. 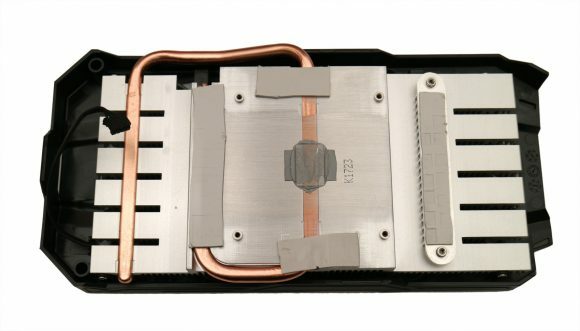 The mining card from Gigabyte does not come with any mounting plate and that can be a bit of an issue for mounting, even though there are no video output connectors available… ASUS for example has it on their version. 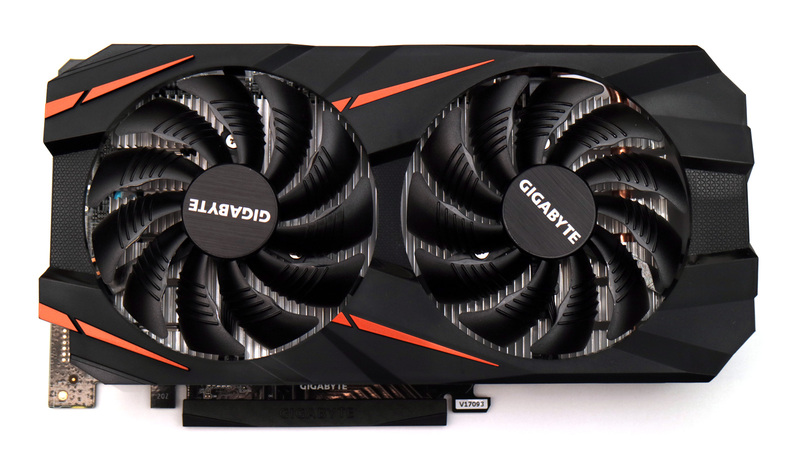 The PCB of the mining card is pretty small and there is no backplate like on the consumer variation of the GTX 1060 from Gigabyte. It is normal, the idea of these cards is to make them cheaper and that needs some cost cutting, though you should still be careful where you cut from and not compromise on important things for miners. There are not warranty stickers on the screws at the back, but who would worry about that when you get the mining card with just three months of warranty instead of the regular 2 or 3 years (depending on the region). The mining card NP106D5-6G is equipped with a single 6-pin PCI-E power connector for external power, the default TDP is 120W. This means that you shoud not be having much trouble with finding a suitable power supply for connecting 6, 8 or even more of these in a single GPU mining rig. A quick look at the cooling solution of the NP106D5-6G. There is a small separate aluminium radiator on top of the voltage regulators that are locate on the left side of the PCB. The big aluminium cooling radiator uses a single copper heatpipe that goes through the GPU and memory chips as well – they are both in contact with the cooler. The heatpipe is in direct contact with the GPU and the big surface of the cooler does a pretty good job in keeping things cool. 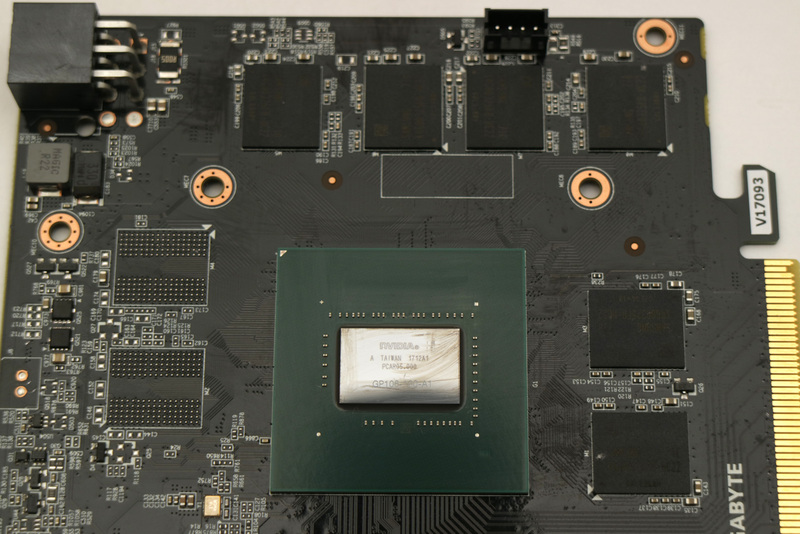 Here is how the PCB looks like, the GPU is labeled GP106-100-A1 and the video memory is GDDR5 from Samsung. The video memory is really important here as this is a mining oriented video card and you need good chips that can handle overclocking for improved performance and the Samsung ones manage to do quite well in that department. The final thing we need to note about the Gigabyte NP106D5-6G, a really important thing is about the cooling fans of the card. 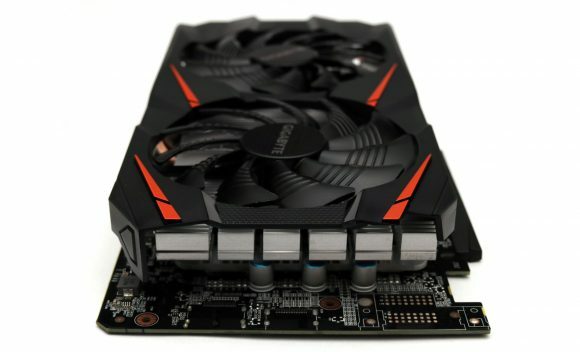 Gigabyte is popular with their pretty good in terms of cooling capacity and silently operating Windforce fans and it is no surprise that we also find them on this board as well. 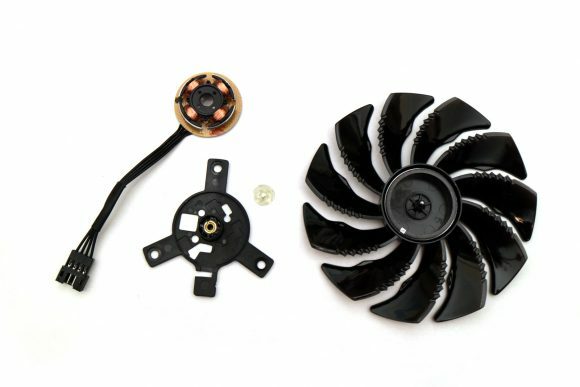 These fans however are not good for crypto mining and we do not like how they handle 24/7 operation under high temperatures, so we are not big fans of these fans. The fans are 92mm ones made by Power Logic and are model PLD09210S12HH (12V, 0.40A) and they use bushings instead of bearings (single or dual). These are cheap fans that may start failing withing a few weeks of mining, we have seen that with other Gigabyte cards using the same cooling fans. We don’t mind as much that you get these with just 3 months warranty, but at least when you are making a GPU for mining use more reliable fans that will last longer (like ASUS does on their version of the P106). All in all we can say that we are not too happy with how Gigabyte approached the situation with their NP106D5-6G mining GPU. They just removed stuff from their consumer GeForce GTX 1060 model and did not address the specific needs and requirements of miners at all. The lack of mounting bracket and the cheap crappy fans in terms of reliability and durability are not Ok. That fact, coupled with the just 3 months warranty, no resell value apart from mining use and just 10% lower price compared to the regular consumer GTX 1060 model does not really help in making this an attractive alternative to smaller home miners.